The National Audubon Society Field Guide to Trees states that approximately 200 species of magnolias exist in the world. Most of these are shrubs and trees that grow in tropical and warmer temperate regions. In the United States, there are 11 separate types of native magnolia trees, as well as many kinds introduced from other countries for ornamental purposes. Sweetbay magnolia (Magnolia virginiana) grows in coastal swamps and alongside brooks, streams and ponds from southern Massachusetts down to Florida. 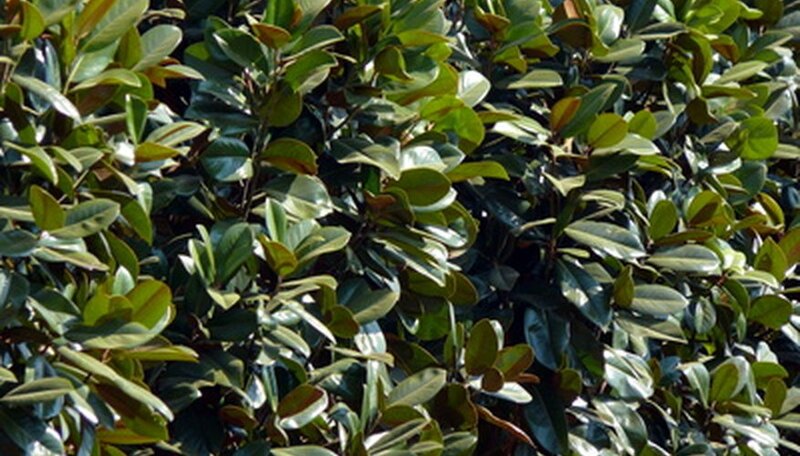 Also called swamp magnolia due to its wetlands habitat, sweetbay grows slender and to heights of around 75 feet. One of the sweetbay magnolia’s traits is fragrant white flowers that grow 2.5 inches wide and have from six to nine petals. Sweetbay’s leaves have a silvery sheen on their undersides and the species produces red, cone-like fruits. Sweetbay grows well in the partial shade and is an easy species to transplant, as long as the ground is moist. In the most southerly parts of its range, sweetbay stays evergreen, but in cooler climates, the tree will shed its leaves. Saucer magnolia, a hybrid of Japanese origins, blooms in late winter or very early spring and is a harbinger of warm weather. Saucer magnolia has a maximum height of about 25 feet and is typically a small tree or very large shrub. This magnolia produces large flowers that the Floridata website says resemble goblets. The buds are fuzzy and open up to reveal six petals that form a flower as wide as 6 inches. The color of the flowers depends on the particular subspecies of saucer magnolia, with purples, pinks and whites some common shades. Fertile soil combined with large amounts of organic matter creates the best scenario for saucer magnolia to grow in and this magnolia will do well with some morning sun and afternoon shade. Saucer magnolia has uses as a shade tree, a specimen plant or in numbers, creating a vivid backdrop for smaller shrubs. Only tropical palm trees that grow in some southern states have larger leaves than the big leaf magnolia in North America. No North American tree has larger flowers as this type, which usually has blooms as wide as one foot. The flowers are a creamy white hue with a purplish blotch at the base of each of the nine petals. Big leaf magnolia, also known as Ashe magnolia, is native to a small portion of the Florida panhandle and grows underneath larger trees. Big leaf magnolia is an endangered species in the wild, making it illegal to take one from its habitat without the landowner’s permission. Big leaf magnolia will start to flower when it is just 3 feet high and this species, which can grow to 20 feet, will stretch towards the sun as it develops, resulting in a contorted trunk.